The Greater Tampa Chamber of Commerce is now accepting nominations for the awards given at the 2015 Military Appreciation Banquet, including the Bob Cutler Volunteer Award and the Business Partner of the Year Award. To nominate a person or business for one of the following categories, please complete each section of the nomination form. Any endorsements the nominator feels will help the selection committee in its deliberations are welcome. All community activities during 2014 should be mentioned. Nomination forms must be received no later than 5 p.m. on January 9, 2015. Click here for more information on the 2015 Military Appreciation Banquet. Thank you to our presenting sponsor Bright House Networks. We are seeking your support for a joint holiday fundraiser to benefit the SGD Paws for Patriots Program. This event will be held on December 9, 2014 at The Centre Club in Tampa, FL. Your cash donation will directly benefit the SGD Paws for Patriots Program. Dr. Harris Silverman of The Eye Associates is a founding member of SGD and is working with our organization to raise money and awareness for this important cause. We also plan to hold a silent auction at our holiday event to benefit SGD’s Paws for Patriot Program. The Greater Tampa Bay chapters of WID and NDIA have set the goal to raise $50,000 at this event to allow us to sponsor ten veterans to attend the 10-day training regimen. Dr. Silverman and The Eye Associates have pledged to match donations for the first $15,000! Your business will be featured as a supporter of the SGD Paws for Patriots Program at our holiday event on December 9, 2014! Any amount you can contribute would be appreciated and will go directly to sponsor training of a veteran. Following graduation from the training program, SGD will share photographs and biographies on each guide dog team that was sponsored through the funds raised at our holiday event. WID/NDIA is a 501(c)(3) entity; your donation is tax deductible to the extent allowed by law. The mission of the Paws for Patriots Program is to create and nurture a partnership between visually impaired or combat weary veterans and a guide dog, facilitating life’s journey with mobility, independence and dignity. SGD has been matching the visually impaired with guide dogs for over 30 years, and is accredited by the International Guide Dog Federation. SGD also trains and places exceptional dogs not suitable for guide work into careers benefiting veterans who suffer from post-traumatic stress syndrome (PTSD). SGD dogs are trained to form a physical barrier between the handler and surrounding people, bringing a calming effect against perceived threats. They provide a warm, physical presence to help mitigate stress reactions. Gaining confidence from these dogs, veterans expand their lives, regain independence and re-integrate into their communities. There are currently 80 combat veterans on the waiting list to attend class at SGD’s campus in Palmetto, Florida. I am writing to you regarding an opportunity to sponsor a veteran to come to the school and receive a veteran service dog. While the students are at the facility, they will each be matched with a guide dog selected just for them. SGD’s professional training staff will teach each student how to handle their veteran service dog. They begin by training on campus, and gradually move to residential streets, city streets, and even the Tampa airport. SGD’s support continues when they return home, to ensure their success as a team. SGD graduates report that having a guide dog allows them to walk confidently, to be more independent, and to enjoy more freedom. Caring for their dog restores a sense of rhythm, encouraging PTSD sufferers to emerge from withdrawal for exercise and the outdoors. This is all made possible through generous donations, and is available to our graduates at no cost. Information on the Paws for Patriots Program can be found here: http://www.guidedogs.org/apply/paws-for-patriots. Mentoring is a rewarding way to share knowledge gained from career success and life experiences. And it is doubly rewarding when you can have this relationship with a military veteran who is pursuing a degree for a civilian career so you can show your appreciation for their service. These talented young men and women have so much to offer – your guidance will certainly help position them for career success. USF’s veterans mentoring program is looking for volunteers to help mentor veterans in the USF program. If you are interested in being a mentor, more information is available on USF’s Veterans Services page. Tuesday, 9 December – 5:00 – 7:00 pm – WID, AFCEA, NDIA and GSOF Holiday Event – being held at the Centre Club – see below for fundraising and silent auction information – Register here. 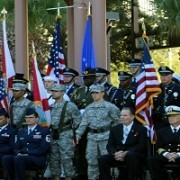 The Greater Tampa Chamber of Commerce held it’s annual Veterans Day Ceremony on 9 November in Joe Chillura Courthouse Square. 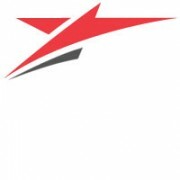 Celestar was honored to be a sponsor for this great event. Thank you to all who participated and volunteered including Progress Village Middle Magnet School Band, Orange Grove Middle Magnet School Chorus, AVAST Vets of Tampa Honor Guard as well as men and women who serve at MacDill AFB. The keynote speaker was Vice Admiral Sean A. Pybus, Deputy Commander, US SOCOM. Click here to view the program for the event. Celestar was happy to be a sponsor for the Tampa Bay Lightning’s annual Seats for Service game on 6 November, 2014. Please join us in honoring our Veterans at the Greater Tampa Chamber of Commerce’s Veterans Day Celebration on Monday, 10 November at 1000 am. Our program includes Progress Village Middle Magnet School and Orange Grove Middle Magnet School students, the Parade of Colors and our keynote speaker Vice Admiral Pybus, US SOCOM. MARK YOUR CALENDARS AND JOIN US IN THE PARK! !